Although he's retired, Fr. Jim Morse, Diocese of Fall River, MA, attends every Good Leaders, Good Shepherds session for the new cohort of priests. Fr. Morse, who was a 2007 graduate of the first cohort of Catholic Leadership Institute's Good Leaders, Good Shepherds, is the coordinator of the program for the diocese. A curriculum comprised of seven residency modules, Good Leaders, Good Shepherds provides priests with leadership skills and best practices designed to increase their confidence and competence in implementing a pastoral plan. Having been involved in the ongoing formation of priests in the diocese for over 20 years, Fr. Morse is a passionate priest who is committed to the leadership development of priests for the diocese. In addition to attending the training sessions with the cohort, Fr. Morse holds "catch up" meetings in between the training sessions to review the material, helps the priests integrate their new skills into parish life, and is a true blessing to this cohort of priests. "This is an excellent program. The longevity of the program enables the priests to come together about every other month over the course of a year for about 3-4 days. They are able to learn practical skills that they can take back to their parish and then return to the training to share their experience," shares Fr. Morse. The current cohort of twenty priests is a diverse mix of younger and longer-term priests, different ethnic backgrounds, pastoral assignments, and a range of experiences. The time spent together in their training is highly valued as they share their learning, apply the material to their day-to-day work, and build fraternal community. Rev. Michael Nagle, Good Leaders, Good Shepherds current participant, shares, "I always learn something new or am reinforced in a learning I had before and have not been using, e.g. write out verbal messages before delivering them and remember to actively listen to others in responses." It has been over ten years since the first graduation of the Good Leaders, Good Shepherds training program. We are grateful to Glenn Creamer and the Honorable R. James (Jim) Nicholson as well as the outstanding work of the National Advisory Board who assisted with the continued partnership with the Diocese of Fall River. 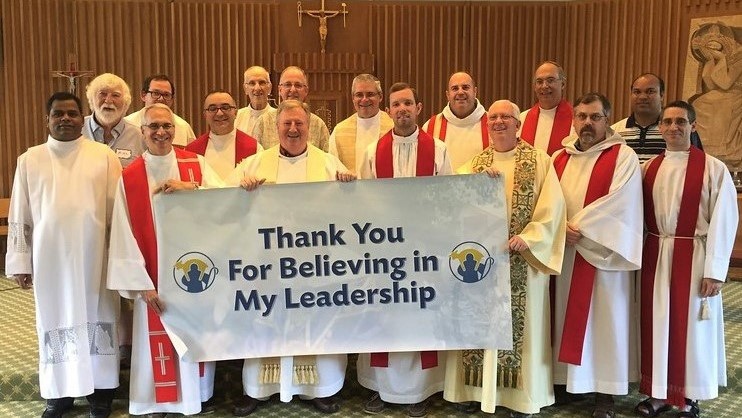 Because you have shared your generous gifts with Catholic Leadership Institute, we are able to support deserving Church leaders around the country. You are a blessing to Catholic Leadership Institute, the Church, and to those we are privileged to serve. Thank you for your leadership, philanthropy, and continued prayers!